This is a “neutral” running shoe meant for road running any distance. It is a breathable, light weight shoe, which when running in the dead heat of summer in Texas absolutely matters. Having run in the now obsolete Magnifly, I noticed a distinct difference in material and breathability. The Fli-Lyte 2 has a crazy wide (think Altra) toe box which is great for those with wide forefeet. It cups the heel snugly and has just right midfoot fit (nothing worse than a too tight midfoot). Let’s talk size. I am so surprised to have not seen anywhere on the internet any mention of how small these run! I first got shipped a size 8.5M since I’m an 8.5 in all other running shoes. I should have known because I couldn’t fit my custom orthotic in the shoe that it ran small. I went ahead and ran 6 miles in them with the insole they came with. (Bad idea when you overpronate). My feet were killing me when I got home, I had blisters forming on the inner sides of my bunions and my hammer toe was bent up and blistered like no other. I realized the 8.5 was simply too small. I contacted Topo Athletic and they reshipped me a new pair of size 9M and I’ve had none of those issues since because I can fit my custom orthotic inside (corrects my overpronation) so no blisters and my hammer toe has room. My friend Tara bought these same shoes and agreed (she doesn’t have bunions or hammer toes) that she needed a half size larger so I know I’m not crazy (well, I am but not about this). (my size 8.5 TopoAthletic Fli-Lyte 2 inserts underneath my size 8.5 custom orthotics. 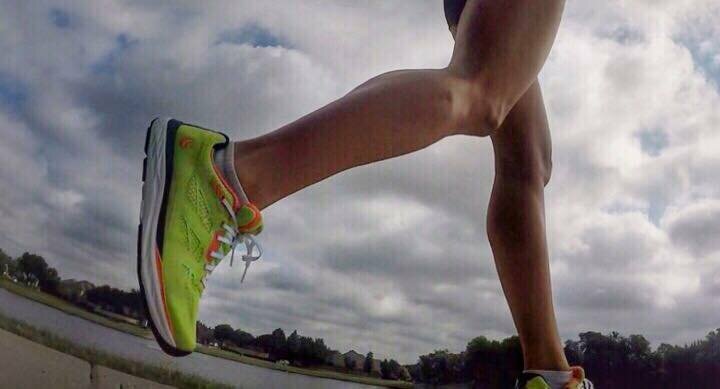 You can see the Fli-Lyte 2 inserts run short). This version of the Fli-Lyte features an updated upper mesh with a medium amount of overlay. I have been running in high 90s temps and high humidity andthey do not retain odor or sweat. I have also run in the rain in them and they do get wet but dry within an hour. The Fli-Lyte 2 midsole is cushiony, not like a Hoka or anything, but definitely more than you would expect for a shoe this light. TopoAthletic says that the midsole’s 3mm drop is engineered to encourage natural loading and foot motion during the gait cycle. The outsoles have exposed EVA (as do many shoes) which is supposed to provide for a softer ground feel. After 60 miles the outer seems to be holding up well. I’ve only run 10 miles at most in these at one time. The ride is smooth and the response of the shoe is good. I’ve tried a lot of shoes and these seem to be a mix of sorts for me. They remind me of Altras with more of a drop (not irritating on my arches). If you like or almost-liked Altras, you may want to try these. I definitely think there are shoes out there that people love or hate. And this isn’t one of those shoes. It’s kind of one of those, it’s good shoes. I’m speaking from the subjective personal experience of me. It’s not that anything is wrong with the shoe. I just have a very particular foot. I think you need to take into account in any review you read the reviewers’ type of foot (when you read clothing reviews, you look at the reviewers build right)? COMPANY: Topo Athletic has been around for a few years and was started by Tony Post, who has 40 years of running experience and 30+ years of running shoe industry experience on his resume. After leaving Vibram, he started Topo on the principal of blending natural running with some traditional shoe elements. The company is small but seems very customer service oriented and easy to work with. They are definitely making their stamp in the running shoe world and gaining recognition among bigger brands. 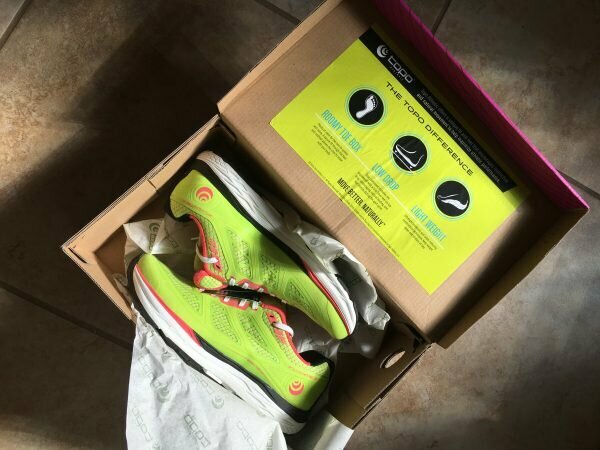 I always suggest checking your local specialty running shoe shop for the best running shoe fit before buying shoes online, but if you know you are a neutral shoe wearer and the Fli-lye 2 might be right for you, check out www.topoathletic.com if you don’t win the free pair. You can use coupon code JESSRUNSBLESSED10 for 10% off your entire purchase on the Topo website (expires 8/31/17). Hope my review helped! Would love to know what you think!